These cactii and pumpkins look great indoors too, but the hi-fired stoneware clay does make them impervious to weather conditions and they will last a lifetime. Sometimes I study an existing type of plant and add some special whimsey, other times I just make what comes to mind! Cactus in dark green with pinched sides and red flowers. Hi-fired stoneware. Cactus in medium green with white flowers. Hi-fired stoneware sculpture. 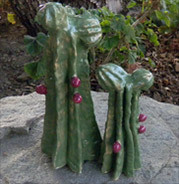 Pair of dark green cactus with purple flower buds. Hi-fired stoneware sculpture. 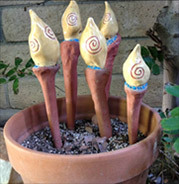 Pod-like garden stakes addinterest to your planter. Hi-fired stoneware sculpture. 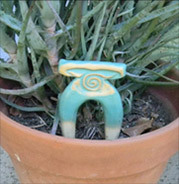 Turquoise garden stakes. Hi-fired stoneware sculpture. 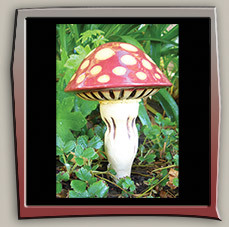 Spotted Red Mushroom. Hi-fired stoneware garden decor. 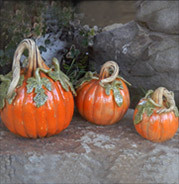 Whimsical pumpkins in natural colors. 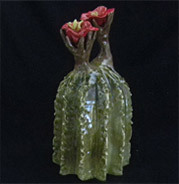 Sold as set of 3 or individualy as small, medium or large. 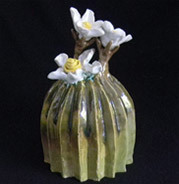 Hi-fired stoneware sculpture. Small cactus in dark green with yellow flowers. 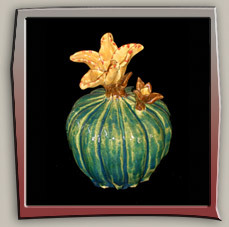 Hi-fired stoneware sculpture.